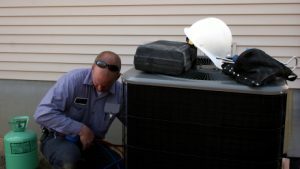 4 Benefits of an Air Conditioning Tune-Up | DeZiel Heating & Air, Inc.
Minnesota experiences long winters that can last for several months. In the dead of winter temperatures often below zero. When you’re air conditioner goes out it’s more than just a discomfort. It can end in disaster and compromise your family’s safety. This is what we often tell most of our clients when they ask why their system need’s a tune-up. Although your Minnesota air conditioner is the most energy utilizing piece of equipment in your home, it is often the most neglected. Therefore, it is important for every homeowner in West Metro, Wright County, and Buffalo to understand why a tune-up is vital. Below are a few useful tips on how you and your household benefit from routine AC maintenance. All worn or damaged parts replaced. Although some companies offer a more comprehensive tune up service such as checking all air ducts and vents for clean air passage, the above mentioned are the absolute basics and essentials. All of these inspections and adjustments should be carried out by a certified, experienced AC company that is licensed by the state of Minnesota. What it comes down to is two choices: Either spend less with routine maintenance and minor repairs, or shell out a lot of cash for major repairs and, inevitably, whole system replacement, which can cost hundreds or even thousands of dollars. The greatest reason for AC in your home is not comfort. But rather, It’s safety and security. When the temperature drops outside, you want to know that your AC system will work without fail. Routine maintenance virtually guarantees that you never have to think twice about your air conditioner during the winter months. Whenever possible, look into investing in a modern air unit, as they are more eco-friendly. With that in mind, remember, that healthier systems are more environmentally friendly and do not emit as much carbon dioxide and other gases into the atmosphere. When you are ready to take advantage of these benefits, then contact the professionals at DeZiel Heating & A/C for an inspection and a tune-up. It’s fast. It’s affordable. It puts your mind at ease and protects your family. If you are looking for a heating & cooling expert in West Metro, Wright County, and Buffalo then please call 763-684-3965 or complete our online request form.